ORLANDO, Fla. (May 10, 2017) - Beginning today, guests can be among the first to book reservations for the newest on-site hotel at Universal Orlando Resort - Universal's Aventura Hotel. Opening August 2018, the sleek and stylish glass tower will consist of 600 guest rooms and bring the total number of on-site hotel rooms at Universal Orlando to 6,200. Rates start as low as $97 per night for a seven-night stay and $116 per night for a four-night stay in a standard room. When booking, guests will receive a free $50 hotel dining credit (per room) with a four-night stay or a free $100 hotel dining credit (per room) with a seven-night stay or longer. This special introductory offer is valid for reservations booked by September 30, 2017 for stays from August 1 to December 20, 2018. 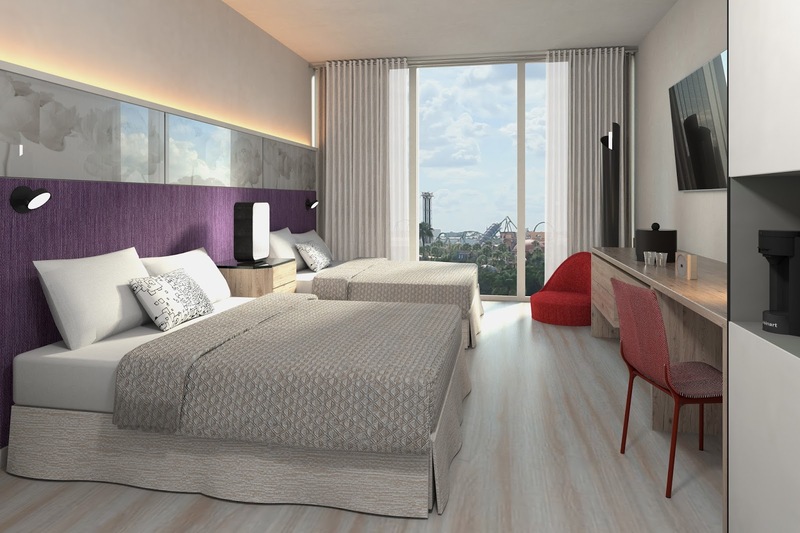 Universal's Aventura Hotel will become the destination's sixth on-site hotel in partnership with Loews Hotels & Co., and will let guests experience a fresh and fun way to stay that's both modern and vibrant. And with unique offerings like the destination's first rooftop bar, Universal's Aventura Hotel will allow guests to sit back and relax while staying in the heart of all the thrills and excitement that Universal Orlando has to offer. At Universal's Aventura Hotel, guests are just steps away from Universal Orlando's three amazing theme parks: Universal Studios Florida, Universal's Islands of Adventure, and the all-new, Universal's Volcano Bay - grand opening May 25 - as well as Universal CityWalk. Universal's Aventura Hotel will be a prime value on-site hotel. More information about the various levels of on-site hotel experiences is available here. Book now! Universal's Aventura Hotel is accepting reservations. Opening Date: Book reservations now for stays starting August 1, 2018. Introductory Offer: Book by September 30, 2017 for stays between August 1 and December 20, 2018 and receive a free $50 hotel dining credit with a four-night stay and a $100 hotel dining credit with a seven-night stay or longer. Rates start at $97 per night for a seven-night stay and $116 per night for a four-night stay. Rooms: 600 guest rooms, including 13 kids' suites, in an atmosphere that's modern and vibrant and offers spectacular skyline views. Amenities: Highlights include a resort-style pool with a hot tub and kids' splash pad, a state-of-the-art fitness center, an immersive, high-tech game room, on-site car rental and a gift shop. Dining: Fast-casual food hall offering a multitude of cuisine styles, a rooftop bar and grill featuring small plates, drink favorites and commanding views of the destination, a lobby bar, a pool bar and grill, and Starbucks. How to Book: To book a hotel stay and explore ticket options for Universal Orlando's three incredible theme parks, visit UniversalOrlando.com or call 800.BE.A.STAR (232-7827). For more than 25 years, Universal Orlando Resort has been creating epic vacations for the entire family - incredible experiences that place guests in the heart of powerful stories and adventures. Universal Orlando's theme parks, Universal Studios Florida and Universal's Islands of Adventure, are home to some of the world's most exciting and innovative theme park experiences - including The Wizarding World of Harry Potter-Hogsmeade and The Wizarding World of Harry Potter-Diagon Alley. And on May 25, 2017, Universal Orlando will open its third park, Universal's Volcano Bay - an entirely new water theme park experience. Universal's on-site resort hotels, Loews Portofino Bay Hotel, the Hard Rock Hotel, Loews Royal Pacific Resort, Universal's Cabana Bay Beach Resort and Loews Sapphire Falls Resort, are destinations unto themselves. Its entertainment complex, Universal CityWalk, offers dining and entertainment for every member of the family. Universal Orlando Resort has unveiled more than 25 new guest experiences since 2010 - powerful attractions, incredible dining opportunities and dramatically themed hotels. Now open is Skull Island: Reign of Kong, a groundbreaking attraction in Islands of Adventure, and CityWalk's newest, unique dining experience, The Toothsome Chocolate Emporium & Savory Feast Kitchen. About Loews Hotels & Co.
Headquartered in New York City, Loews Hotels & Co. hospitality company is rooted in deep heritage in the hotel industry and excellence in service. The hospitality group encompasses branded independent Loews Hotels, and a solid mix of partner-brand hotels. Loews Hotels & Co. owns and/or operates 24 hotels and resorts across the U.S. and Canada, including Hotel 1000 in downtown Seattle and the Loews Sapphire Falls Resort at Universal Orlando, the fifth hotel in partnership with Comcast NBC Universal. Located in major city centers and resort destinations from coast to coast, the Loews Hotels portfolio features properties grounded in family heritage and dedicated to delivering unscripted guest moments, all with a handcrafted approach. For reservations or more information about Loews Hotels, call 1-800-23-LOEWS or visit: www.loewshotels.com.